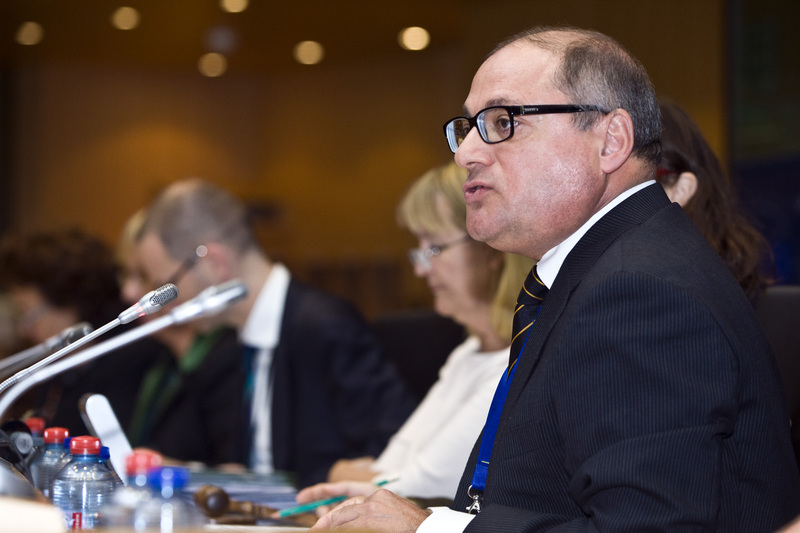 James Calleja, along with the directors of ETF, Eurofound and EU-OSHA, presented the work of their respective EU agencies to the European Parliament Committee on Employment and Social Affairs (EMPL) on 4 November in Brussels, with a particular focus on informing new committee members. He invited the members of the EMPL Committee to make use of Cedefop resources for their work both at European level and in their constituencies. In his speech, the Cedefop Director noted: ‘What we stand for is high-quality vocational education and training (VET), which is relevant to the labour market. This need is a priority today for the EU. What we capture as an agency is the relationship between skills, qualifications and employability. Three questions are at the centre of our work programme: how do we combine a highly educated labour force with adequate job creation? How do we increase participation in a shrinking and ageing labour market? And how can training help address inequality and move us towards a green economy? ‘Cedefop operates at the interface between training and the labour market. Overall, we have three priorities: modernisation of VET; empowerment of individuals in career and transitions even at a later age or at a later stage in their employment; analysing skills by forecasting what labour market will need in the coming years. ‘An independent evaluation of Cedefop in 2013 said that our work as an agency of the EU is highly esteemed even outside the EU itself. We are recognised as a leading centre when it comes to qualifications frameworks and study and research analysis on skills. We also fulfil the training aspects of the EU when it comes to training and employability. Finally, the external evaluation said that we do not duplicate what other agencies within the EU do. ‘Our work is widely used: Since 2005, we have had 96.6 million visits to our web portal, 42 million European citizens have downloaded and used our Europass CV. Last year, we had 173 citations in EU documents, which is an increase of about 12% on the previous year. In 2013, over 606 000 publications were downloaded from our site and 68 000 were seen by European citizens. ‘There is a process which started in 2002, and which we follow keenly with the European Commission, the Copenhagen process. It was fine-tuned with the Bruges Communiqué in 2010. Our targets are clear: we want to reduce early school leavers, to encourage more people to remain in lifelong learning, and this is the work we do in Thessaloniki. ‘It is not just publications. We gather social partners, Member States and together we try to achieve the objectives, which are enshrined in the Bruges Communiqué. These processes can be more successful if Member States, if you yourselves as MEPs, encourage Member States to use even more the principles of the Bruges Communiqué and in particular the European tools, such as the European qualifications framework, the Europass, the European credit system for vocational training, the validation of non-formal and informal learning or the quality assurance of vocational training. ‘These are all recommendations which the European Parliament has agreed upon over the years. Many countries are using these tools, but my plea is for you to encourage more Member States to use them. These tools give greater transparency to qualifications between States, they increase quality of vocational training, they give more accessibility to training and attractiveness, and, even more, they allow European citizens to be mobile internally and across Member States. ‘Another area of analysis is what we do on careers and transition – the issue of lifelong learning. How can we help citizens remain employable? It is not just access to the labour market, but we are encouraging Member States to enter into areas such apprenticeship programmes or work-based learning. ‘In fact, next year we will be launching a new programme on costs and benefits of apprenticeship schemes, particularly for SMEs and across all European Member States. One lesson I have learned from a conference in Switzerland was that the more SMEs and the more firms train people, the more they count the benefits. The more you do not train, the more you count your costs. This is an important message which our firms should take very seriously. ‘We have to come close in terms of your work and our work. The agency itself is an independent European resource, but, more than independent, I would want to see EU agencies becoming more interdependent, more interactive with your work, your roadmap, your ideas in the coming years. ‘It is only when you touch the base of society that you realise what work needs to be done to improve employability of our citizens. We are a European agency aiming to transform in Member States the weaknesses into strengths when it comes to vocational training, and the strengths, in many European Member States, into sustainability. ‘We have enough models of how VET has transformed economies. Where VET is strong, unemployment –particularly of young people– is very low. Where VET is not so strong, unemployment is very high. ‘We want to continue raising awareness, understanding of the relationship between labour market and VET. We are ready to provide insights to identify common European approaches and principles to improve this relationship and we serve, and will continue to serve, including yourselves, as a meeting place of the diverse interests of our policy-makers. You can watch Mr Calleja’s speech and the rest of the EMPL Committee meeting here. Check out more photos of the meeting.